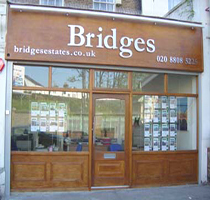 Bridges Estates is a leading local independent Estate Agency specialising in both Residential Sales and Lettings/Property Management. We are a family run business and the office is managed by Chris Polycarpou who has 25 years agency experience with the last 12 years in the local area. We are members of the Property Ombudsman for estate agents. Contact our office on 020 8808 5225 if you would like help or advice on selling or letting your home; general information regarding the local property market or to arrange a free market valuation/appraisal. We accompany all applicants to view your property whether you are selling or letting. We always provide feedback to viewings to let you know both positive and negative comments. Find out property prices in your area for FREE!